Last minute review code means you’ll have to wait for our verdict, but here are some early thoughts. Mafia 3 is out now on PC, but our review isn’t ready. Why? Because 2K only gave us review code yesterday afternoon UK time. Not ideal, but here are some early impressions based on seven hours of play. I quite like it. First, let’s talk about the frame rate. As I write this, Mafia 3 is locked to 30 frames per second on PC. The developer says it’s aware of this, and that a patch due for release this weekend will fix it, but it’s still bewildering. They should have known PC gamers would react badly. But I have, at least, managed to tune it out. At first the controls felt sluggish, in that way games running at 30fps do, but I’ve slowly gotten used to it. I don’t even think about it anymore, and I’m managing to enjoy the game for what it is, rather than the amount of frames it’s running at. Of course, as soon as the patch is out I’m switching to 60. I loved Mafia 2. Yeah, it was a pretty by-the-numbers shooter, whose open-world was ultimately an elaborate, overly detailed backdrop for a linear action game. But it was a superb period piece set in a beautiful, atmospheric city, and had an engaging story and colourful characters. And my opinion of Mafia 3 is much the same. It’s definitely more of an open-world game than the previous one, with fewer scripted missions and more stuff scattered around the map you can access at your leisure. Still, I’m enjoying my time in New Bordeaux, mainly because of the setting. The graphics don’t have the high-end sparkle of something like Grand Theft Auto 5, but it makes up for it with detailed world-building, excellent sound design, and some impressive lighting—especially in the rain at night. It’s an incredibly stylish game too, using cinematic editing and licensed music, Scorsese-style, to reinforce the ‘60s setting. The story is a pretty standard crime yarn so far, but it’s told confidently, and the cutscenes feature some incredible facial animation. Nice to see my old pal Vito back too. The setting throws up some interesting moments in the open-world. I wandered into a bar and was wondering why the owner started hurling racist abuse at me. Turns out it was ‘whites only'. I refused to leave, so he ran off and tried to call the cops. But I managed to choke him out before he did. Also, on the subject of NPCs, I gotta hand it to this waitress. Scared for her life, but holding that tray like an absolute pro. Give that woman a raise. A big part of the game is taking over rackets (drugs, prostitution, etc.) which involves a lot of driving around the map beating people up, destroying stuff, and intimidating people. And, for the last two hours, I feel like this is all I’ve been doing. After a very plot-heavy first few acts, it feels like ages since I saw the last cutscene or story mission. Hopefully the racket system isn’t the whole game. When I saw some early footage of Mafia 3 showing off the stealth and the see-through-the-walls Batman vision, I groaned. But, surprisingly, it’s one of my favourite parts of the game. The AI isn’t terribly smart, but sneaking around and quietly strangling racist rednecks is really fun. It reminds me ever so slightly of Metal Gear Solid 5, but nowhere near as deep or polished. 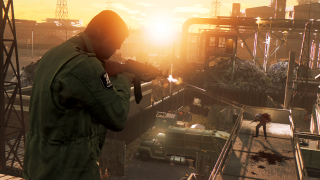 Mafia 3 isn’t the best open-world game I’ve played, but it certainly isn’t the worst so far. My review, which you can read next week, will be much more in-depth, but I still haven’t fully decided what I think of it yet. I know I don’t hate it, but I’m not sure if I love it either.